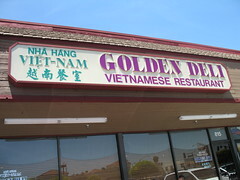 Bax, Giggles, and I tried Golden Deli Vietnamese Restaurant last week. Giggles had heard and read good things about it, so we managed to convince the non-pho-loving Bax to indulge us. Lucky for Bax, Golden Deli has a large array of non-pho Vietnamese dishes, too, so our dear Bax did not go hungry. 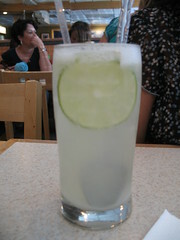 Giggles enjoyed her fresh lemonade, which included a full lime slice. 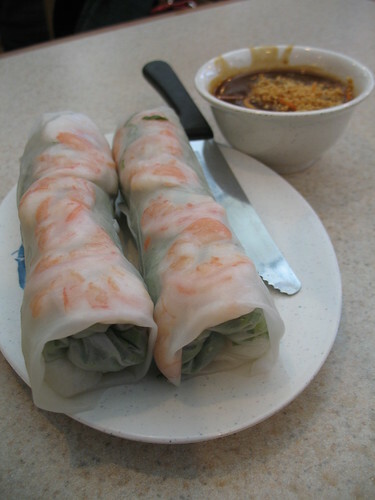 We shared an appetizer of goi cuon. A bit on the bland side, but still refreshing on a hot day. Despite the sweltering heat, I decided to order pho, and I was so glad I did! 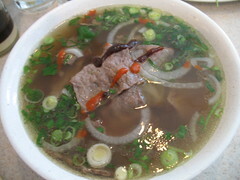 It was very very good, and I understand why Los Angeles Magazine crowned Golden Deli the "best pho in L.A." in 2007. Thumbs up for Golden Deli. Yummy and cheap! there's this saying in korean about how you should eat hot and spicy foods on hot days to counteract the hot...i don't get it, but it actually somehow works. maybe because you sweat so much leading you to sit under the fan, which then evaporates said sweat? anyway, rambling. bax should try the vermicelli noodle dishes with pork [spring] roll and ground pork, if she's a pig-eater. if not, there are other non-pork versions of that dish. mmm...my go to when i'm not in the mood for pho (VERY rare). I LOVE pho! I get the plain pho tai, so good. 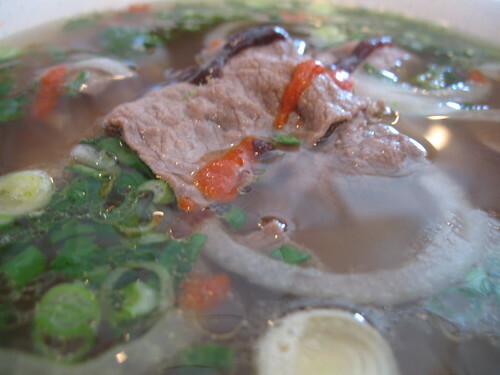 Best pho in LA for 2007? That is a totally strong statement. I don't know how you could have possibly had pho this hotass weekend, btw. yum!!! and yay for a food post after the drought! BUT, lemonade is my crack these days. i would kill for pho right now. weather be damned. that's it. i'm going to golden deli this week, 90 degree temps or not. this post is almost making me crave vietnamese food again. i should give this place a try, because i'm with bax in the non-pho loving. Ewwww. What the pho were you thinking?